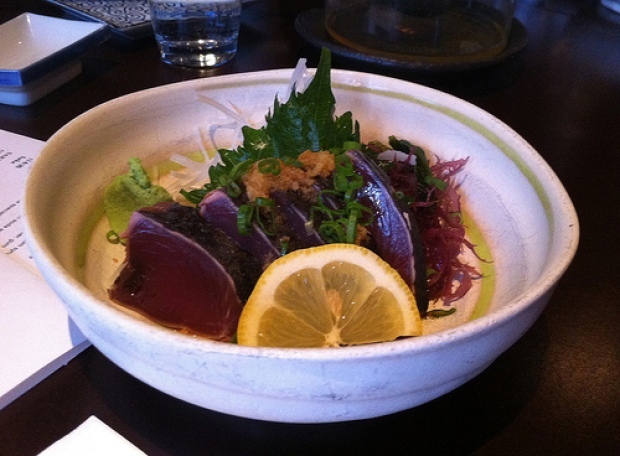 Bay Area foodie reviews San Francisco's Chotto. Wakamesu at San Francisco’s Chotto. I’ve written about the Bay Area’s proliferation of izakayas before. It feels like nearly every month there’s a new izakaya in town — not that I’m complaining. San Francisco’s Chotto, which opened this summer, has been among the most buzz-worthy, and with good reason. Excited at the prospect of grilled offal and fresh seafood, I had dinner at Chotto with a few friends one balmy evening. Located in the Marina District, Chotto’s cool, modern aesthetic betrays the neighborhood’s somewhat touristy vibe. (Sorry. It had to be said. Please don’t take offense, Marina dwellers.) Once we were seated, we pored over the eclectic menu. 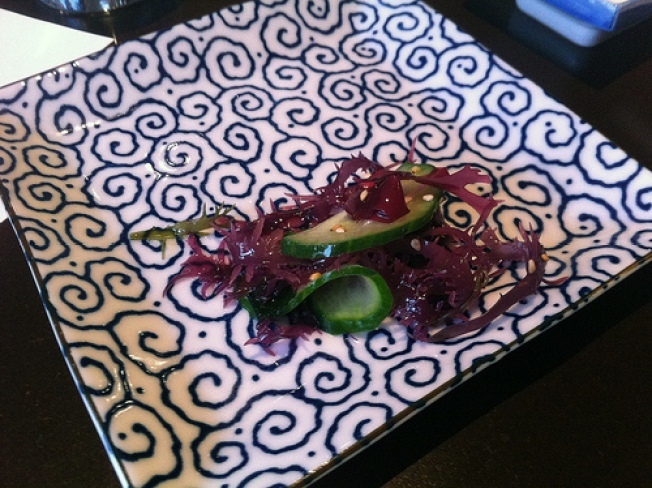 The small plates are served family-style, and the wakamesu, or seaweed and cucumber salad came first. This was a good palate cleanser, and I loved the crisp texture of the purple seaweed, which I don’t usually see in wakamesu. Next came the spicy tuna. I love tuna, but I’m not a big fan of the spicy tuna you usually see in maki sushi because it’s often the less palatable cuts minced up and blended with chili sauce to mask the texture and flavor. This, on the other hand, was one of my favorite dishes of the evening. Buttery, flavorful cuts of tuna were drizzled with a sweet, spicy sauce that didn’t overpower at all. We soon ordered a second plate. Next came the uni, the most beautiful dish of the evening. Served atop shredded daikon radish and red bell peppers, this creamy uni tasted of the sea without being fishy. In other words, it tasted the way good uni should taste. The applewood bacon mochi arrived next, and it was a hit. Chewy, plain mochi were wrapped in crisp, smoky bacon and briny nori seaweed. Bacon and seaweed don’t usually go together, but in this case, it worked wonders. The gyutan, or Kobe beef tongue, arrived next, and it was one of my personal favorites. The tongue was tender, and the chili sauce was a perfect accompaniment to the strong flavors of the grilled beef. Our next offal dish was the grilled chicken hearts, served with shichimi chili. Chicken hearts are one of my favorite types of offal: perfectly chewy, delicately flavored, and well, delicious. These were no exception. We shared a few more dishes, but by this point I’d lost count. Suffice to say, Chotto is among my favorite izakayas in the Bay Area, and with friendly, helpful service to boot. Who knew one restaurant could so easily change my opinion of the Marina District?